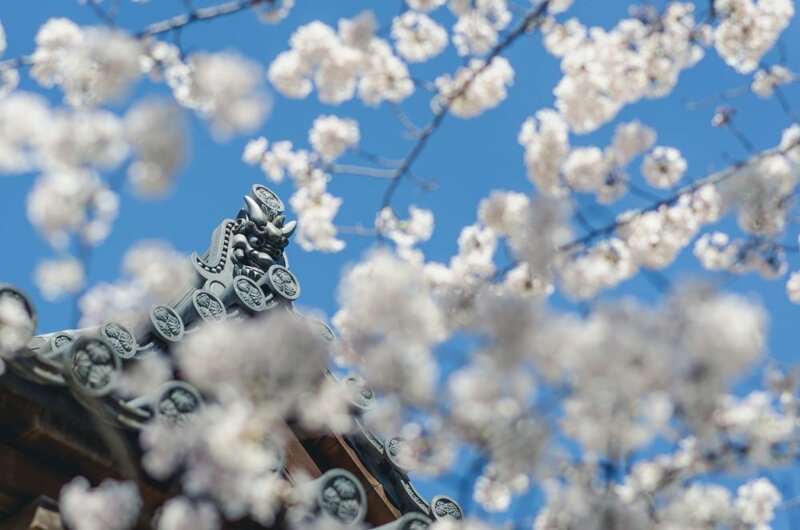 The beauty of Zojoji's architecture mixed with the beauty of blossoms makes for a grand contrast. 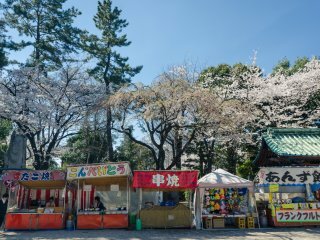 Even at Zojoji you can expect to see food and other booths to enjoy refreshments while also enjoying the sight of the blossoms above. 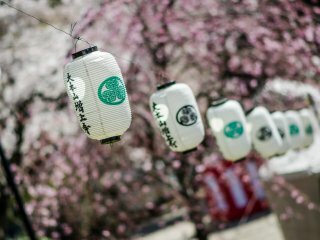 Lanterns are a popular decoration wherever cherry blossoms are found. 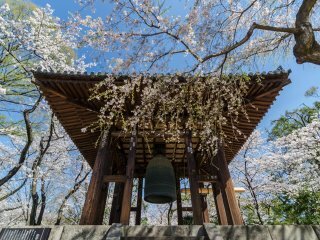 Even Daibonsho (the Big Bell) is surrounded by blossoms! This bell was completed in 1673, making it not only a work of art but an artifact of history. 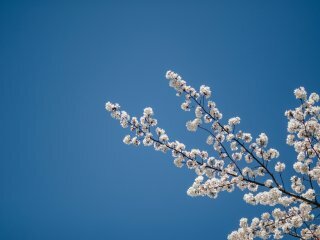 There is nothing quite as lovely as enjoying the beauty of the sakura against the backdrop of a blue sky. 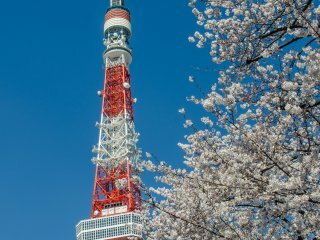 Although Zojoji is quite old, being in the heart of Tokyo it also boasts views of many modern buildings such as the world famous Tokyo Tower. 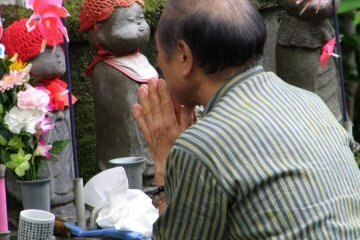 One corner of Zojoji is lined with many ojizosan - small statues resembling babies. Even in this corner there are many cherry blossoms to be found, and of course everyone wants to get a photo of them! This small sakura type bonzai tree sits in front of Zojoji welcoming visitors. 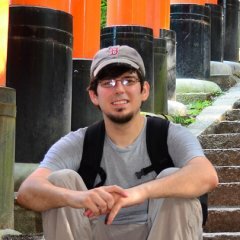 One of my favorite parts about the cherry blossom season is that it isn't over when the petals begin to fall. Even on the ground these petals are lovely, particularly on a bed of green moss which can often be found at temples such as Zojoji. 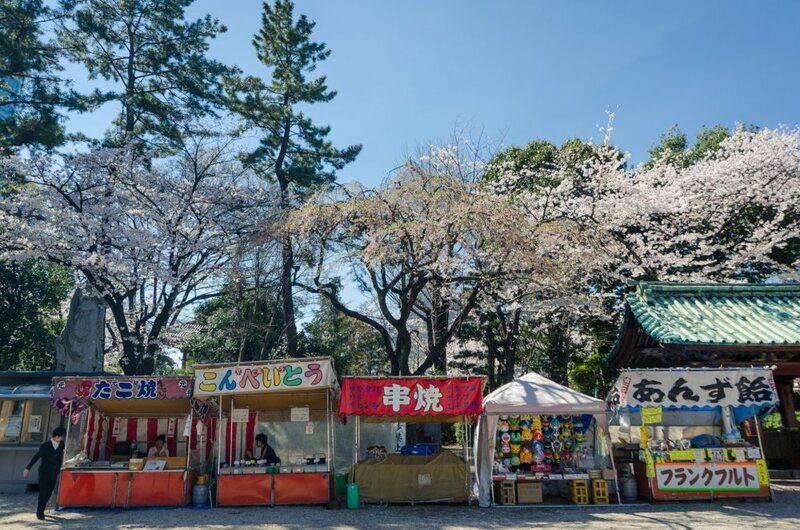 These omikuji (basically fortunes) have been left tied to cherry blossom trees around Zojoji. Even on a cloudy day, the grounds of Zojoji are lovely, especially with the sakura in bloom! Zojoji Temple in Tokyo is not only one of the city's most famous temples but is also one of its oldest. In fact, the main gate to the temple is the oldest wooden structure in Tokyo. 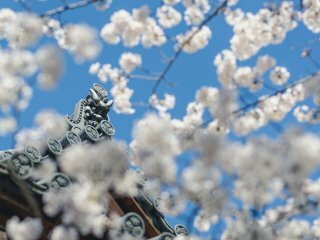 Between the architecture and deep sense of culture surrounding the temple, many visitors might miss the fact that Zozoji also has some of Tokyo's most lovely cherry blossom trees. However, if you come during the right window of the Spring, you can't miss it. 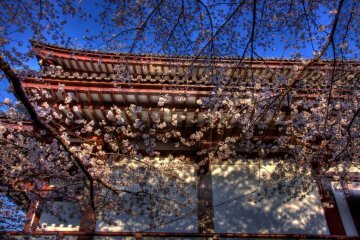 The sakura (cherry blossoms) on the Zojoji grounds are splendid, and mixed with culture, architecture, and history of the temple, it's a must-see sight for anyone planning a trip to Japan. 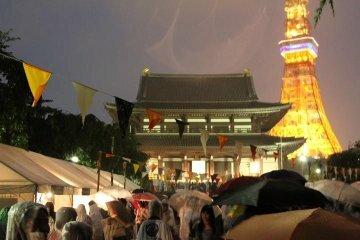 I love Zojoji for that mix of tradition with modernity in the background. 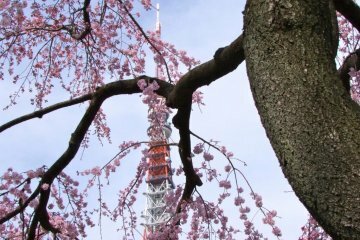 Love the shot you took of the blossoms with Tokyo Tower. These pictures are so refreshing! Amazing photos and great angles!